While much of the world has moved on from the 2007 housing crisis, with popular real estate markets like New York, Las Vegas and San Francisco now fully recovered and in some cases enjoying an even greater bubble, there are still places in the US that were ignored by the recovery, where the housing collapse still haunts everyday lives and where things simply never got better. About 5.1 million homeowners in the United States are still living with the consequences of the global financial crisis, according to a new report by Attom. 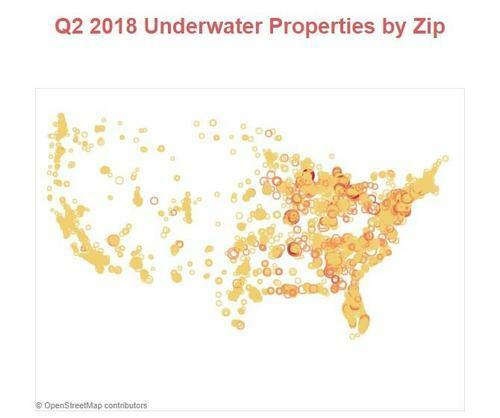 As of June 30th of this year, about 1 in 10 homes in the United States was "seriously underwater", an indicator that the market value of homes were at least 25% lower than the balance on mortgages. While this rate is an improvement over the 12.8 million homes that faced the same issue in 2012, it is still twice the number that is considered to be healthy by real estate analysts. The towns that have been the most disproportionately affected by the housing crisis are commuter towns, exurbs and military towns. These types of communities across the midwest and mid-Atlantic have seen weaker income and job growth than the rest of the country. They were simply left behind by the way our "recovery" was staged. Inflated prices prior to the crisis also helped make a true recovery extraordinarily difficult for these areas. In 2006, at the peak of the bubble, homeowners Michael Payne and his wife Gail escaped from a New York City high rise to move to the mountains in Pennsylvania, where they were excited to be able to get a $168,000 four bedroom home in a gated community. Payne said about their 2006 purchase, "It was going for the American dream. We felt rich." But today, they are facing a much harsher reality: the home is now worth less than half of what they paid for it. Gail and Michael had planned on retiring by relying on the equity in their home. Instead, Gail finds herself commuting two hours a day from Monroe County, Pennsylvania to the Bronx to continue working as a special education teacher. The community that they live in, once appealing with tennis courts, a swimming pool and clubhouse, now badly needs a cosmetic makeover. Homes in the community that one sold for $300,000 are now being valued for as little as $72,000. Buyers dried up just as quickly as lenders tightened up, after the crisis. 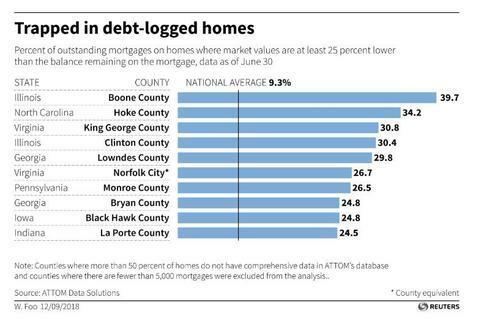 More than one in four homeowners in Monroe County are "underwater" on their mortgages. Boone County, Illinois is facing the same problem. Almost 40% of the homes in this county, which is about 80 miles outside of Chicago, are also underwater. There, some houses that were selling for $225,000 during the boom are now a valued at about $85,000. It gets worse: at a local housing community in Boone County called Candlewick Lake, a third of the community's houses were vacant by 2010 and unemployment in the area had spiked to 18% after large layoffs at a local auto assembly plant made. “It just got ugly, real ugly, and we are still battling to come back from it,” said Karl Johnson, chairman of the Boone County board of supervisors. Like the Payne's home in Monroe County, this community also needs work. Its roads are falling apart, the common areas need a "facelift" and the once serene community lake has become "a cesspool", according to residents who spoke at a recent association meeting. Homeowner dues of about $1200/year that one seemed reasonable are now deterring potential buyers, which means that every dollar needs to be stretched in order to keep the property kept up. Also disproportionately affected are military communities. Half of the top 10 U.S. counties that are underwater are near military bases and are home to both active-duty soldiers and veterans. The VA made financing for many of these homes available, and it also attempts to make defaulting difficult for individuals who finance through them. This has enticed many in the military who are underwater to stay with their homes, despite them being worth less than what is left on the mortgage. Poor credit can threaten the security clearance of military members and may put future loans from the VA at risk. Instead, the recovery in housing took the strongest hold in areas like coastal markets and cities. Unfortunately, things don't look like they will be getting better for those who have missed the recovery, and making matters worse, it now appears that the next housing downturn is upon us. 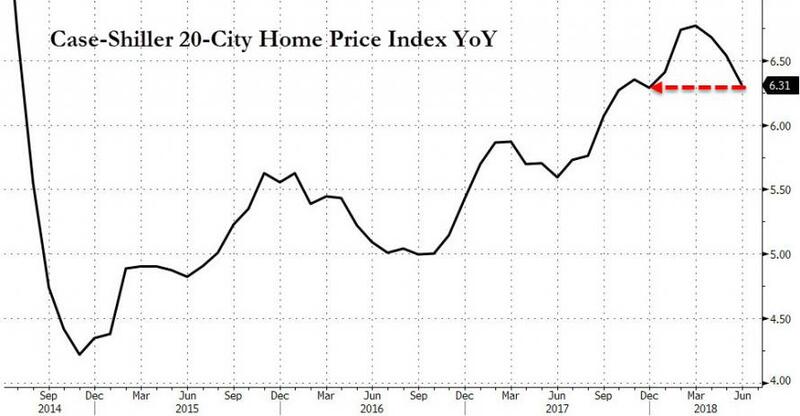 One month ago we explained why that the new global housing bubble also looked to be in the midst of popping. Back in July, we discussed why there would be more "trouble ahead" for the housing market. Oddly, just a few months ago, real estate was still on fire. Prices were blowing past records set during the previous decade’s housing bubble as desperate buyers bought whatever was available at above the asking price while homeowners, confident that prices would keep rising, held out for the next big pop to sell. Then, as if someone flipped a switch, the trend shifted into reverse. For the past several decades it’s been the explicit policy of governments and central banks to use low interest rates and more recently direct purchases of stocks and bonds to reflate the price of financial assets. The goal was to make holders of those assets feel rich and "smart" and therefore more inclined to borrow and spend on frivolous stuff that would boost GDP. This is called the wealth effect and it’s been firing on all cylinders in the age of QE and ZIRP. But all that borrowing – by individuals to buy houses (and SUVs and 70-inch flat-screens), corporations to buy back their stock at record high prices, and governments to build unnecessary roads and bridges and invade each other – has left a lot of debt lying around that has to be paid off with future cash flow. This means for people like Michael and Gail Payne and those in Boone County, Illinois, things could get significantly worse before they ever get better.